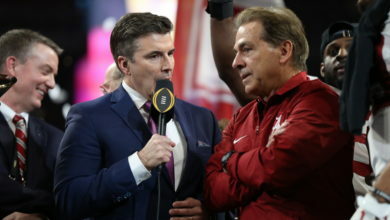 College Football Week 9: ABC and ESPN Televise Two Most-Watched Games Across All Networks; ESPN’s Networks Earn Nearly Three Times the Minutes of All Other Nationally Rated Networks Combined; Streaming Usage Up Year Over Year - ESPN Press Room U.S.
ESPN’s triple header of Big Ten games on Saturday, Oct. 29, resulted in large total live audiences (TV + streaming), year-over-year growth both collectively and in each game window with each game landing among ESPN’s highest TV audiences for the season. Collectively, the three games (Michigan at Michigan State, Northwestern at Ohio State and Nebraska at Wisconsin) delivered an average total live audience of 4,171,000 viewers, up 28% from the similar three TV windows week 9 of last season on ESPN. Individually, Michigan at Michigan State (noon ET) delivered a total live audience of 4,787,000 viewers, up 30% from last season’s comparable game (Ole Miss at Auburn). Nebraska at Wisconsin (7 p.m.) had a total live audience of 3,871,000 viewers and Northwestern at Ohio State (3:30 p.m.) delivered a total live audience of 3,761,000 viewers, up 3% and 46%, from the two comparable games last season (Michigan at Minnesota in primetime and Oklahoma State at Texas Tech in the afternoon). Michigan-Michigan State’s total live audience of 4,171,000 viewers is the network’s most-watched game since opening weekend and the third most-watched of the season. The stream of the Wolverines-Spartans game had an average minute audience of 140,000 viewers and total of 32,017,000 minutes watched, becoming a top 10 streamed regular season college football game ever for ESPN. ESPN’s stream of the Cornhuskers-Badgers game had an average minute audience of 101,000 viewers and a total of 419,000 unique viewers watching 20,661,000 minutes up 23%, 12%, 67%, respectively, year over year (Michigan at Minnesota). Similarly, the Wildcats-Buckeyes had a streaming average minute audience of 104,000 viewers, 452,000 unique users watching 21,345,000 minutes, up 70%, 53%, 49%, respectively, year over year (Oklahoma State at Texas Tech). ABC’s Saturday Night Football featuring Clemson at Florida State (8 p.m.) delivered a total live audience of 5,475,000 viewers, the most watched college football game on Saturday across all networks. Regional Action: Louisville at Virginia or Penn State at Purdue (noon): A total live audience of 2,964,000 viewers, up 14% year over year (Syracuse at Florida State). Baylor at Texas (3:30 p.m.): A total live audience of 3,554,000 viewers, up over the comparable window from last year (regional action: Maryland at Iowa and Clemson at NC State). Tennessee at South Carolina (7 p.m.) delivered a total live audience of 1,557,000 viewers, the third most-watched game of the season on ESPN2 and up 289% year over year (Vanderbilt at Houston). *ABC, ESPN, ESPN2, ESPNU and ESPN Deportes (TV only data). SEC Network, SEC Network Alternate, ESPNEW and Longhorn Network are not included as they are not Nielsen rated networks.